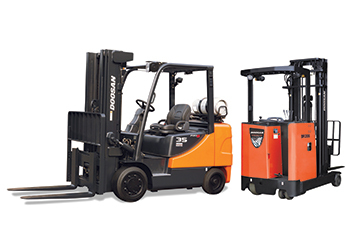 Doosan’s pneumatic diesel forklift trucks ... part of the Lifting Equipment division’s range. SDEC’s Lifting Equipment division has high-specification forklifts and mounted cranes designed to meet a variety of application requirements. The Lifting Equipment division of Saudi Diesel Equipment Company (SDEC) says it can meet the various lifting requirements of customers in the Saudi market with its vast fleet that represents world-renowned brands. 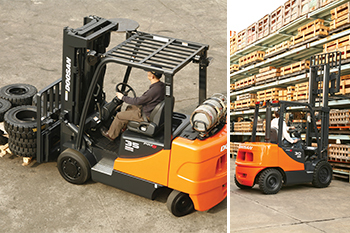 The division offers a wide array of Doosan forklifts models including engine and electric forklift trucks, reach trucks and warehouse equipment, in addition to telescopic truck-mounted cranes from Dongyang. Doosan is the world’s leading value forklift brand built on a solid framework of manufacturing experience over 40 years, he says. The company is expanding its product range and continues to build on a reputation for reliable and high-quality products designed to meet the most demanding needs of the global market. The Lifting Equipment division offers Doosan’s pneumatic diesel forklift trucks in capacities ranging from 1,500 to 16,000 kg, pneumatic LPG forklift trucks in capacities from 1,500 to 9,000 kg, and electric forklift trucks in capacities of 1,500 to 5,000 kg. 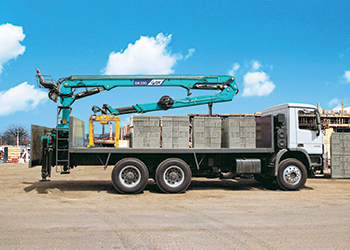 Dongyang truck-mounted cranes ... part of SDEC’s portfolio. Operating initially as part of SDEC’s construction equipment division, the Lifting Equipment department became a separate entity under the SDEC umbrella in September 2007. Nine years on, it boasts a long list of satisfied clients that include Saudi Arabian Airlines, Riyadh Cable, the Riyadh Metro, and National Gas and Industries Company (Gasco). The division has also received several recognitions from Doosan for its excellent sales performance, followed by accolades from the manufacturer for sales excellence and top dealer performance, he adds. The division supplied Gasco in 2014 with seven-tonne diesel forklifts and recently secured an order to supply more of them, which are to be delivered shortly. It is also poised to supply a large order of eight-tonne diesel forklifts to Saudi Aramco. “Gasco is the sole company delivering gas supplies to homes in Saudi Arabia, thus this was an important deal for Saudi Diesel,” says Al Ansi, who is very pleased to receive the latest order from the gas company. “The previous machines exceeded the client’s expectations in terms of performance and quality, and our service commitment to them was exceptional, thus they ended up ordering additional units,” he comments. Doosan ... building on a reputation for high-quality products. Commenting on the order to supply Saudi Aramco, he says the division supplied the forklifts to the oil conglomerate through a single supplier. “All machines operate in Aramco under Aramco specifications. This was a significant bulk deal for SDEC; although we have sold to Aramco many times before, it was always through separate suppliers, and in smaller quantities,” he states. The Lifting Equipment division’s forklifts have received safety approval from Gasco, Al Ansi says, adding that they are capable of working in congested areas such as the Riyadh Metro. SDEC was established in 1978. Formerly known as Saudi Diesel Generators Company, SDEC is part of the Abduljawad Group of Companies, which includes Universal Motor Agencies, Barwil Shipping, PLC Arabia, and Saudi Amana Construction. Over the years, SDEC has established itself as a prominent player in the construction equipment market by providing high-quality machines. In addition, SDEC has become a pioneer in the diesel generators industry through having a local manufacturing facility to design, develop, and produce its own branded generator sets along with power-related accessories. This has helped SDEC to establish its niche and develop and grow its business exponentially over the years. Today, the company’s portfolio has expanded to include concrete and lifting equipment, equipment rentals, and attachments. It also continues to grow as the sole distributor of many international brands. “Our aim is to offer customers total confidence in their materials handling fleet, thus allowing them to get the maximum out of an operation. As a result of our dedication and hard work, today we are one of the top players in the Saudi market for lifting equipment,” Al Ansi concludes.